I love the anticipation, especially considering this restaurant has been on my radar for years and my tasty buds have been eagerly awaiting the famous fettuccine al Tartufovo. 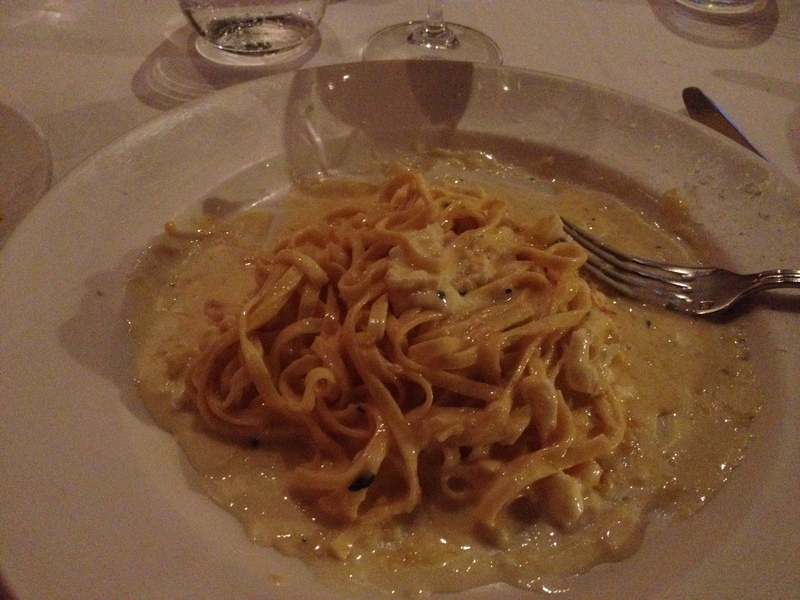 The dish that Italy’s Grazie magazine stated was the ‘best pasta in the world’. High praise indeed. Our friend Libby, who has a wonderful knack for recommending great restaurants, gave Buon Ricordo a double thumbs up awhile back. This evening I’m with Bun, Duck, Cam and Bron, which sounds like a crew from a bank heist. Upon arrival standing right in the middle of the restaurant is the man himself owner Armando Percuoco, the sommelier Robert Leys and 2 waiters. The ground floor was empty of the dining public as most of the early arrivals were upstairs so it felt like Armando and the team were waiting just for us. Great start. As we’re seated Armando introduces his Sommelier and we’re off and running. We discuss the menu, scan the extensive wine list and take in the surroundings. Cam and Bron are thinking degustation with matching wines, as if on cue Armando appears and asks “Are you allergic to anything? Is there anything you don’t like?” When he hears “No”, Armando’s eyes light up, “Let me take care of you” he beams, and with that some surprise dishes are in store. After we’ve ordered our meals a complimentary Bruschetta arrives for everyone, which is phenomenal. The tomatoes are fantastic and later on in the night I ask Armando about them, he says poetically, “We must let them ripen naturally”. We work our way through the entrée’s, which get overwhelming approval with Cam and Bron loving their Hiromassa Kingfish, the first dish in their degustation. Now its time to get serious with the arrival of the Fettuccine al Tartufovo. There is a sense of drama with its introduction as the waiters scurry around getting into position; the aroma of the truffle is dazzling as the plate is presented. Shaved Parmesan cheese is grated onto the pasta, then the waiter puts the utensils to work slicing and dicing, the egg collapses into the pasta mixed in with the cream and the Parmesan. After the first mouthful I quickly realize it’s lived up to the hype, its rich no doubt, probably the richest thing I’ve ever tasted but since the dish itself is the size of a softball so there is no way I’m not finishing it. I’m a slow eater and the waiters do a few unobtrusive ‘drivebys’ to see where I’m at, all the plates are cleared, but not until I’ve finished, no detail is left unattended. Bun also enjoyed the Fettuccine, savoring every bite, as did Cam and Bron, whose degustation continued with the Fagottini, pork and veal sausages bound with Parmesan and truffle egg, finished with lemon extra virgin olive oil. Duck ordered another one of the Buon Ricordo classics, the Bracioletta Reginaldo, veal rolled with spinach and parmesan which is grilled, “Amazing” I heard the Duck say. As the night rolls on the old world ambience permeates the air with the classic paintings on the wall, the flowery designs on the chairs and Air-kissing moments as the regulars are greeted warmly at the door. Dining here stands alone as its own event, not just a catch-up with friends or a birthday celebration. Desert is ordered and Bun has the Tortina al Cioccolato, a rich chocolate tart with a Macedonia of fruit and coconut gelato, which I tried and was fantastic. As if I needed more cheese in my life I finished the night off with a Southern Highlands Blue Vein complimented by a Central Ranges Chardonnay. Wonderful. Next time I’ll try the Limoncello. Armando’s passion for food and hosting shines through in Buon Ricordo and before we leave I see him taking a moment, sitting alone in the corner enjoying an Italian liqueur of some sort surveying what he has created in front of him, a job well done I’d say. Summary: Has it lived up to the hype? Absolutely! 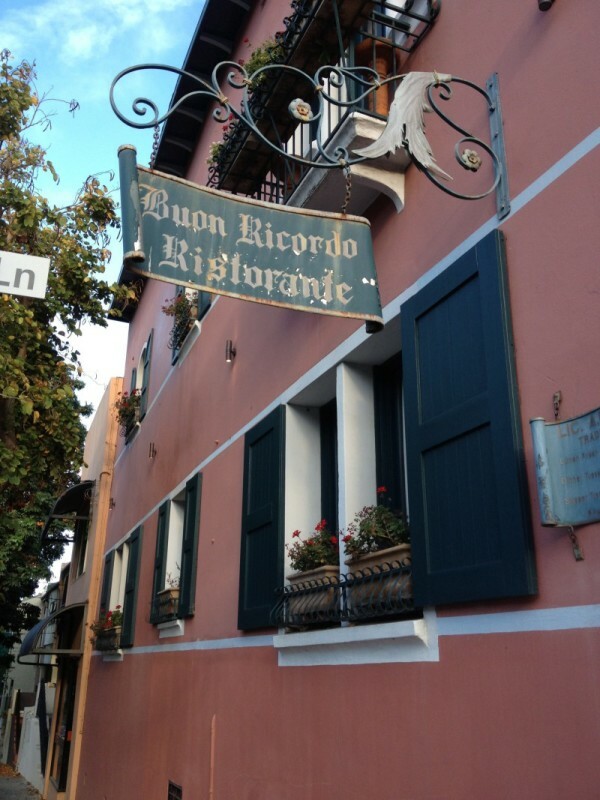 Its old world Italian charm with wonderful food. You have to try it, at least once. Previous PostSlayer ‘Repentless’Next PostWhy the Denver Broncos? Sounds amazing. Perhaps a dinner date there when I come up next???? Oh yeah, I can just taste that fettuccine al tartufovo now. Good review Hally. You’ve convinced me to come to Sydders for some pasta!